There are, I understand, plenty of reasons NOT to care about the Rock & Roll Hall of Fame, or the induction ceremony that happened this weekend. — Rock was born out of — and has thrived on — rebellion from “institutions,” so why have an official rock institution? — Rock should be about the music, man, not long, oh-so-serious speeches about it. — And how, pray tell, can you take seriously a Rock Hall of Fame that won’t recognize Rush? The list of reasons goes on. And hey, they’re all probably right. Until this weekend, I’d spent a total of 45 seconds of my life thinking about the Rock and Roll Hall of Fame (which has to be above average among even rock fans). — Half of ZZ Top, along with guitar slingers Derek Trucks and Joe Bonamassa, play the blues of the late Freddy King after King’s daughter told a touching story about how she only found out what her father did for a living when her mom took her to a concert in Chicago at the age of 6 and her dad walked out on stage and lit up the room. Acceptance speeches are oh-so-serious and forgettable up until the moment they make you feel someone’s joy. — A reunited Guns N&apos; Roses (OK, minus Axl Rose and Izzy Stradlin) play a sloppy “Mr. Brownstone” and a much tighter “Sweet Child O’ Mine” and “Paradise City” with help from a fill-in singer who that day must have had both the most- and least-enviable gig in the world. Steven Adler — the drummer whom the other members of Guns N&apos; Roses kicked out for doing too many drugs! — couldn’t hide his elation at being back, if just for a night. — Chris Rock share his love for the Red Hot Chili Peppers and make Axl jokes. “Even if Axl was going to show,” Rock said at around 1 a.m., “he wouldn’t be here yet.” Minutes later, Flea broke down a little thanking his mom. Losing a bit of the mystique of rock stars can sometimes be a good thing. — Bette Midler making me a bit misty-eyed — for the first time since Beaches! — when she inducted the late Laura Nyro, a singer-songwriter who Midler described as someone who made the everyday lives of New Yorkers seem grand and romantic. Nyro meant a lot to a lot of people. I’ll admit, though, I’d never heard of her. I’d never heard of legendary engineer Tom Dowd, another inductee, either. Hell, I barely knew the music of the Red Hot Chili Peppers beyond the hits before this weekend. We all have gaps. But it’s invigorating to get to fill them in, if just a little. What were those criticisms of the Rock of Hall Fame again? The reason, though, that I wanted to be at the ceremony was for the group that has meant the most to me over most of my life. 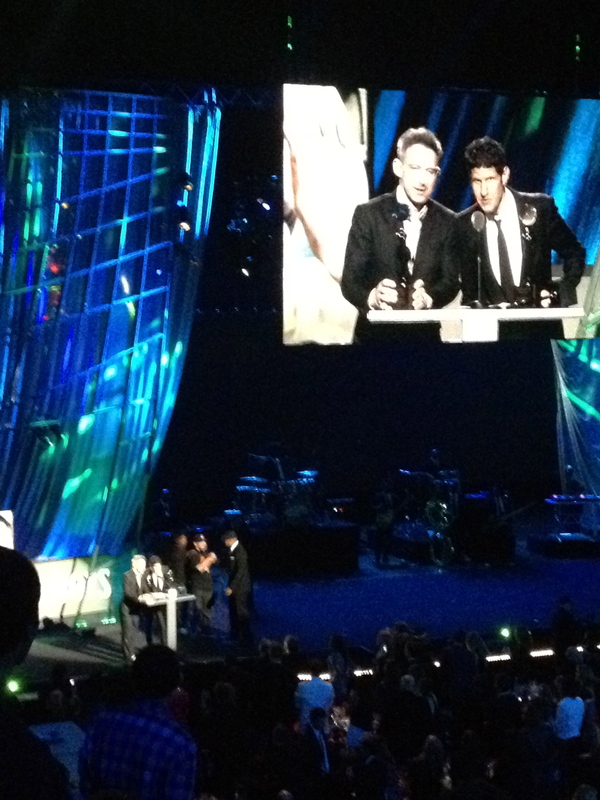 The Beastie Boys, inducted . . . damn . . . 25 years after their debut record. And I wanted to be there with my friend — one of the many for whom mutual affection for the band has been an immediate signifier that a strong friendship would grow and endure. One of the pleasures of life is to keep discovering new things and experiences and art. At the same time that the Beastie Boys have helped me do just that (they’ve been my path to so many other kinds of music and pieces of the culture), it’s been hard for me to find a greater joy than my Beastie experiences. At 13 seeing the Licensed to Ill tour, or at 18 in the basement of my friend’s house when we taped on VHS the second half of the “Pass the Mic” video and watched it over and over again, or everything having to do with Paul’s Boutique. So, I wanted to be in Cleveland for myself. But as cheesy as it sounds, I wanted to be there in Cleveland for the Beastie Boys. MCA, one third of the group, wasn’t there. He’s had throat cancer for the last few years. The group isn’t talking much about it, so I won’t speculate as to what his absence meant. Because I have no idea, and it’s not my business, either. Ad-Rock and Mike D, the other two Beastie Boys, were there. They were heartfelt in their remarks, which is not what you expect or usually want from the Beasties in public. Ad-Rock read an equally heartfelt letter from MCA. MCA’s parents were in the audience. Chuck D and LL Cool J inducted the band. Chuck D spent a little too much time talking about hip-hop in general, but that’s his thing, as my friend pointed out. Adrock and Mike D didn’t perform, and I think I’m glad they didn’t. I hope they were happy to be there. The Beastie Boys have always been synonymous with fun. They’re the music I put on when I need a little confidence, some swagger and a reminder that whatever I’m about to do isn’t life or death. I can’t say the Beasties portion of the show was fun. But it wasn’t the opposite of fun, either. My thoughts on the experience are still plenty unformed, and I don’t want to say something I don’t mean here. But I will say that the Beastie Boys have always been leaders for a portion of people of my generation; they were always a step ahead. They celebrated Brooklyn long before it became a hipster haven; they did the same for 1970s culture. Of course, they introduced rap to so many of us as kids, and, ahead of us, they grew into the kind of adults we hoped to be. Now, they seem, sooner than anyone would have liked, to be leading the way into the next inevitable phase of life, too, whatever that may turn out to be. I fear I’m getting too serious here. I don’t want to give fodder to the Rock and Roll Hall of Fame detractors. It was an amazing night.